Half of this Grade 1 listed building was stripped of its deteriorated grotesque gothic stucco profiles and adornments, we were then commissioned to supply exact copies. This was the first Grade I listed building to have been granted the use of reconstituted stone by English Heritage. 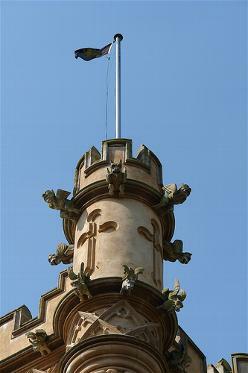 Typical grotesque Gothic features include the Green Man, Bat-on-Tunn and Gargoyles. These sit with the more traditional elements of tracery, label moldings and cornice work.Particular attention was made into producing a colour and texture to match that of the original building which had previously been unsuccessfully attempted during earlier phases of restoration. 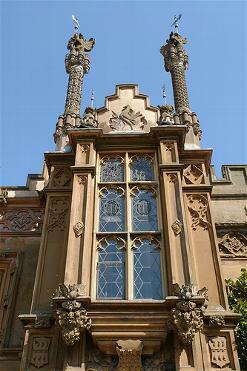 Label mouldings, cornice and decorative tracery, adorned by winged Beasts and figure work.